Royal Caribbean International’s newest ship, Quantum of the Seas, exited the enclosed building hall at the Meyer Werft Shipyard in Papenburg, Germany today, revealing an unexpected occupant – a 30-foot-tall magenta polar bear situated prominently on the exterior deck of the ship. 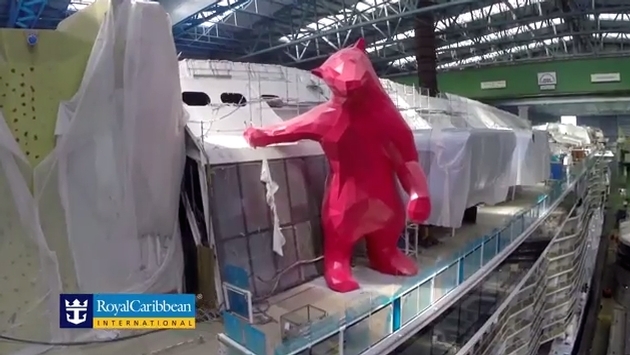 The bear, a sculpture created by Denver-based artist Lawrence Argent, is the first glimpse of the 2,980 piece, multi-million art collection themed “What Makes Life Worth Living” that has been curated for Quantum of the Seas. In addition to Lawrence Argent, an impressive portfolio of artists, including Paul Villinski, who created a monumental installation called “Crossing” which encompasses a wall of 210 butterflies representing 30 species, each made of aluminum, stainless steel, acrylic and enamel; sculptor Soo Sunny Park, whose sprawling, undulating structure titled “Waves of Light,” explores the light’s potential as a structural element. Pieces by these artists and others span size, art forms and mediums, and can be enjoyed both inside and outside the ship. The bear titled “From Afar” is comprised of 1,340 stainless steel triangles, weighs approximately eight-tons and is intended to incite wonder among guests, encouraging them to admire the bear from afar, as well as interact with it on a more intimate, yet whimsical level. The piece helps guests explore the ship’s art theme by showcasing intangible qualities of what makes life worth living, such as peace, love, joy, gratitude and passion, which is what Quantum’s art pieces are meant to evoke, while sister ship, Anthem of the Seas, scheduled to debut April 2015, uncovers tangible aspects of the theme such as adventure, entertainment and nature. For more than 20 years, International Corporate Art (ICArt) has curated the collections for Royal Caribbean’s global fleet of 21 ships. The team combs the world for inspiring artists, new and seasoned, who create intriguing works to be showcased on the cruise line’s ships, a process that generally takes two to three years. The groundbreaking Quantum-class ships, Quantum of the Seas and sister-ship Anthem of the Seas will introduce a new set of first-at-sea onboard experiences, such as Ripcord by iFLY, a heart-pounding skydiving experience; North Star, a thrilling adventure that transports guests more than 300 feet in the air on a breathtaking journey; cutting-edge transformative venues including SeaPlex, the largest indoor sports and entertainment complex at sea with bumper cars, roller skating and more; and the cruise line’s largest and most advanced staterooms ever. The Quantum Class spans 18 decks, encompasses 167,800 gross registered tons, carries 4,180 guests at double occupancy and features 2,090 staterooms. Quantum of the Seas will sail out of New York Harbor from her homeport of Cape Liberty for her inaugural season before departing to her new homeport of Shanghai (Baoshan), China.